/saɪˈliːʒə/ or /saɪˈliːʃə/; Polish: Śląsk [ɕlɔ̃sk]; German: Schlesien (help·info); Silesian German: Schläsing; Czech: Slezsko; Silesian: Ślůnsk [ɕlonsk]; Latin: Silesia) is a historical region of Central Europe located mostly in Poland, with smaller parts in the Czech Republic, and Germany. Silesia is rich in mineral and natural resources and includes several important industrial areas. Silesia's largest city and historical capital is Wrocław (German: Breslau). Other large cities are Opole (Oppeln), Gliwice (Gleiwitz), Katowice (Kattowitz) in Poland; Ostrava; Opava in the Czech Republic; and Görlitz (Polish: Zgorzelec) in Germany. Its main river is the Oder (Odra). Silesia's borders and national affiliation have changed radically over time, both when it was a hereditary possession of noble houses and after the rise of modern nation-states. The first known states to hold power there were those of Greater Moravia at end of 9th century and Bohemia early in the 10th century. In the 10th century Silesia was incorporated into the early Polish state, but it later broke into independent duchies, coming under increasing Czech and German influence. It came under the rule of the Crown of Bohemia, which passed to the Austrian Habsburg Monarchy in 1526. Most of Silesia was conquered by Prussia in 1742, later becoming part of the German Empire, the Weimar Republic and Nazi Germany up to 1945. After World War I the easternmost part of this region was awarded to Poland by the victorious Allies after rebellions by Silesian Polish people and a plebiscite. After World War II the bulk of Silesia was transferred to Polish jurisdiction and became part of Poland. The remaining parts of Silesia went to Czechoslovakia after World War I, and are part of the Czech Republic with the part west of the Oder-Neisse line in Germany. Most inhabitants of Silesia today speak the national languages of their respective countries (Polish, Czech, German). There is an ongoing debate whether a local Silesian speech should be considered a Polish dialect or a separate language. There also exists a Silesian German or Lower Silesian language, although this form of German is almost extinct. The names of Silesia in the different languages most likely share their etymology—Latin and English: Silesia; Polish: Śląsk; Old Polish: Ślążsk[o]; Silesian: Ślůnsk; German: Schlesien; Silesian German: Schläsing; Czech: Slezsko; Slovak: Sliezsko; Kashubian: Sląsk; Upper Sorbian: Šleska; Lower Sorbian: Šlazyńska. The names all relate to the name of a river (now Ślęza) and mountain (Mount Ślęża) in mid-southern Silesia. The mountain served as a holy place in prehistoric times. According to some Polish Slavists the name ‘Ślęża’ [ˈɕlɛ̃ʐa] or ‘Ślęż’ [ˈɕlɛ̃ʐ] is directly related to the Old Slavic words "ślęg" [ˈɕlɛ̃ɡ] or "śląg" [ˈɕlɔ̃ɡ], which means dampness, moisture or humidity. They disagree with the hypothesis of an origin for the name Śląsk [ˈɕlɔ̃sk] from the name of the Silings tribe, an etymology preferred by some German authors. Silesia has historically been an ethnically diverse region. In the fourth century BC Celts entered Silesia settling around Mount Ślęża near the modern Wrocław, Oława and Strzelin. Germanic tribes were first recorded within Silesia in the first century. Slavic peoples arrived in this territory around the Seventh century. In the early ninth century the Slavic settlement stabilized. Local Slavs started to erect boundary structures like the Silesian Przesieka and the Silesia Walls. In those days the eastern border of Silesian settlement was situated to the west of the Bytom, and east from Racibórz and Cieszyn. East from this line dwelled a closely related Slav tribe, the Vistulans. Their northern border was in the valley of the Barycz river, north of which dwelled Polans. The first known states in Silesia were Greater Moravia and Bohemia. In the tenth century, the Polish ruler Mieszko I of the Piast dynasty incorporated Silesia into the Polish state. During the Fragmentation of Poland, Silesia, as well as the rest of the country, was divided among many independent duchies ruled by various Silesian dukes. During this time, German cultural and ethnic influence increased as a result of immigration from German-speaking parts of the Holy Roman Empire. 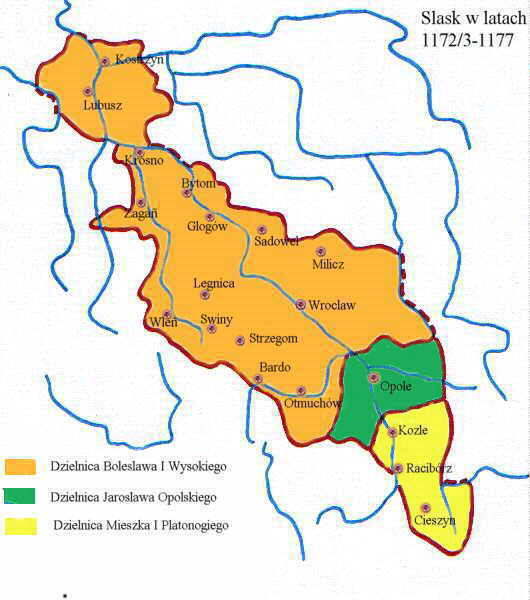 In 1178, parts of the Duchy of Kraków around Bytom, Oświęcim, Chrzanów and Siewierz were transferred to the Silesian Piasts, yet their population was of Vistulan and not of Silesian descent. Between 1289 and 1292, Bohemian king Wenceslaus II became suzerain of some Upper Silesian duchies. It wasn't however until 1335 when Polish kings renounced their hereditary rights to Silesia. The province became part of the Bohemian Crown under the Holy Roman Empire, and passed with that crown to the Habsburg Monarchy of Austria in 1526. In the 15th century there were several border changes of the province. First of all parts of the territories that were transferred to the Silesian Piasts in 1178, were bought by the Polish kings in the second half of the 15th century (the Duchy of Oświęcim in 1457 and the Duchy of Zator in 1494). The Bytom area however remained in the possession of the Silesian Piasts, even though it was a part of the Diocese of Kraków. Secondly the Duchy of Crossen was inherited by Margraviate of Brandenburg in 1476 and, with the renunciation by King Ferdinand I and estates of Bohemia in 1538, it became an integral part of Brandenburg. In 1742, most of Silesia was seized by King Frederick the Great of Prussia in the War of the Austrian Succession and subsequently made the Prussian Province of Silesia. Consequently, Silesia became part of the German Empire when it was proclaimed in 1871. After World War I, Upper Silesia was contested by Germany and the newly-independent Second Polish Republic. The League of Nations organized a plebiscite to decide the issue in 1921. It resulted in 60% votes being cast for Germany and 40% for Poland. Following the third Silesian Uprising (1921), however, the easternmost portion of Upper Silesia (including Katowice), with a majority ethnic Polish population, was awarded to Poland, where it was formed into the Silesian Voivodeship. The Prussian Province of Silesia within Germany was then divided into the provinces of Lower Silesia and Upper Silesia. Meanwhile Austrian Silesia, the small portion of Silesia retained by Austria after the Silesian Wars, was mostly awarded to the new Czechoslovakia (becoming known as Czech Silesia), although most of Cieszyn and territory to the east of it went to Poland (see Zaolzie). Polish Silesia was among the first regions invaded during Germany's 1939 attack on Poland. One of the goals of Nazi occupation, particularly the occupation of Upper Silesia, was to expel the Polish Silesian population. German repatriation of Poles in Upper Silesia was made a priority for two crucial reasons. First, Nazi Germany was resentful over the loss of Silesia after the uprisings of the early 1920s and wished to regain the region for its natural resource wealth and strategically important locomotive network. Second, the Nazi war machine needed more members. Those repatriated as German were immediately subject to military service, thus bolstering the German Army's numbers. As for the non-German speaking Polish population of Silesia, they were reduced to a lower worker class status and were oftentimes severely mistreated by their new German overlords. This treatment would be addressed by the Poles years later. In 1945, Silesia and its population went through another traumatic change. The German expulsion of Poles from Silesia was echoed by Polish expulsion of Germans. The Potsdam Conference of 1945 concluded that the Oder-Neisse would be the official border between Germany and Poland. Millions of German Silesians were evicted from their homes and replaced by Poles from the East. Furthermore, the newly formed Polish United Workers' Party created a Ministry of the Recovered Territories that claimed half of the available arable land for state-run collectivized farms. Many Silesian residents not only resented the Germans for their invasion in 1939, but now also the newly formed Polish communist government for their population shifting and interference in agricultural, as well as industrial, affairs. The administrative division of Silesia within Poland has changed several times since 1945. Since 1999 it has been divided between Lower Silesian Voivodeship, Opole Voivodeship, Silesian Voivodeship and Lubusz Voivodeship. Czech Silesia is now part of the Czech Republic, forming the Moravian-Silesian Region and the northern part of the Olomouc Region. Germany retains the Silesia-Lusatia region (Niederschlesien-Oberlausitz or Schlesische Oberlausitz) west of the Neisse, which is part of the federal state of Saxony. Most of Silesia is relatively flat, although its southern border is generally mountainous. It is primarily located in a swath running along both banks of the upper and middle Oder (Odra) river, but it extends eastwards to the upper Vistula river. The region also includes many tributaries of the Oder, including the Bóbr (and its tributary the Kwisa), the Barycz and the Nysa Kłodzka. The Sudeten mountains run along most of the southern edge of the region, though at its south-eastern extreme it reaches the Silesian Beskids and Moravian-Silesian Beskids, which belong to the Carpathian range. Silesia has undergone a similar notional extension at its eastern extreme. Historically it extended only as far as the Brynica river, which separates it from Zagłębie Dąbrowskie in the Lesser Poland region. However to many Poles today, Silesia (Śląsk) is understood to cover all of the area around Katowice, including Zagłębie. This interpretation is given official sanction in the use of the name Silesian Voivodeship (województwo śląskie) for the province covering this area. In fact the word Śląsk in Polish (when used without qualification) now commonly refers exclusively to this area (also called Górny Śląsk or Upper Silesia). Since the middle of the 18th century, coal has been mined. The industry grew during German rule and peaked in the 1970s under the People's Republic of Poland. During this period Silesia became one of the world's largest producers of coal, with a record tonnage in 1979. Coal mining declined during the next two decades but has increased again following the end of Communist rule. There are 41 coal mines in Silesia, most forming part of the Gornoslaskie Zaglebie Weglowe coalfield which lies in the Silesian Upland. The field has an area of about 4,500 km2. Deposits in Lower Silesia have proven to be difficult to exploit and the area's unprofitable mines were closed in 2000. In 2008 an estimated 35 billion tonnes of lignite reserves was found near Legnica, making them some of the largest in the world. From the fourth century BC iron ore has been mined in the upland areas of Silesia. The same period saw lead, copper, silver and gold mining. Zinc, cadmium, arsenic, and uranium have also been mined in the region. Lower Silesia features large copper mining and processing between the cities of Legnica, Głogów, Lubin and Polkowice. The region is known for stone quarrying specifically in the Swietokrzyskie Mountains and in the Lublin Upland primarily to produce limestone, marl, marble, and basalt. Polish names of Silesian cities in Polish, from a 1750 Prussian official document published in Berlin during the Silesian Wars. Modern Silesia is inhabited by Poles, Germans, Czechs and Silesians. The last Polish census of 2002 showed that the Silesians are the largest national minority in Poland, Germans being the second; both groups are located mostly in Upper Silesia. The Czech part of Silesia is inhabited by Czechs, Moravians, Silesians and Poles. Before the Second World War, Silesia was inhabited mostly by Germans and Poles, with a Czech and Jewish minority. In 1905, a census showed that 75% of the population were Germans and 25% Poles. The German population tended to be based in the urban centres and in the rural areas to the north and west, whilst the Polish population was generally rural and in the east. Silesia's Jewish community, who were concentrated around Breslau and Upper Silesia, numbered 48,003 (1.1% of the population) in 1890, decreasing to 44,985 persons (0.9%) by 1910. In Polish East Upper Silesia the number of Jews was around 90,000-100,000. After the German invasion of Poland in 1939, the Jewish population of Silesia was either placed in ghettos or expelled to the General Government. Those sent to ghettos would from 1942 be expelled to concentration and work camps. In August 1942 10,000 to 13,000 Silesian Jews were killed at Auschwitz. There were seventy thousand Jews in Lower Silesia at the end of the war. The majority of Germans fled or were expelled from the present-day Polish and Czech parts of Silesia during and after World War II. From June 1945 to January 1947, 1.77 million Germans were expelled from Lower Silesia, and 310,000 from Upper Silesia. Today, most German Silesians and their descendants live in the territory of the Federal Republic of Germany, many of them in the Ruhr area working as miners, like their ancestors in Silesia. In order to smooth their integration into West German society after 1945, they were placed into officially recognized organizations, like the Landsmannschaft Schlesien, with financing from the federal Western German budget. One of its most notable but controversial spokesmen was the CDU politician Herbert Hupka. Prevailing public opinion in Germany is that these organisations will achieve reconciliation with the Polish Silesians, which is gradually occurring. The expulsion of Germans led to widespread underpopulation. The population of the town of Glogau fell from 33,500 to 5,000, and from 1939 to 1966 the population of Wrocław fell by 25%. Attempts to repopulate Silesia proved unsuccessful in the 1940s and 1950s, and it was not until the late 1970s that Silesia's population reached pre-war levels. Wrocław 632,162 293 km² Lower Silesian V.
Ostrava* 336,556 214 km² Moravian-Silesian R.
Wałbrzych 126,465 85 km² Lower Silesian V.
Legnica 105,750 56 km² Lower Silesian V.
^ Jankuhn, Herbert; Beck, Heinrich et al., ed (2006). "Wandalen" (in German). Reallexikon der Germanischen Altertumskunde. 33 (2nd ed.). Berlin, Germany; New York, New York: de Gruyter. "Da die Silingen offensichtlich ihren Namen im mittelalterlichen pagus silensis und dem mons slenz - möglicherweise mit dem Zobten gleichzusetzen [...] - hinterließen und damit einer ganzen Landschaft – Schlesien – den Namen gaben [...]". ^ Lukowski, Zawadski, Jerzy, Hubert (2006). A Concise History of Poland. Cambridge, UK: Cambridge University Press. pp. 256–257. ISBN 978-0-521-61857-1. 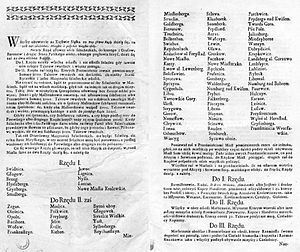 ^ Prusian document from 1750 in Polish - "Wznowione powszechne taxae-stolae sporządzenie, Dla samowładnego Xięstwa Sląska, Podług ktorego tak Auszpurskiey Konfessyi iak Katoliccy Fararze, Kaznodzieie i Kuratusowie Zachowywać się powinni. Sub Dato z Berlina, d. 8. Augusti 1750"
^ Hunt Tooley, T (1997). National Identity and Weimar Germany: Upper Silesia and the Eastern Border, 1918-1922, University of Nebraska Press, p.17. ^ Kamusella, T (2007). Silesia and Central European nationalisms: the emergence of national and ethnic groups in Prussian Silesia and Austrian Silesia, 1848-1918, Purdue University Press, p.173. ^ Steinbacher, S. "In the Shadow of Auschwitz, The murder of the Jews of East Upper Silesia", in Cesarani, D. (2004) Holocaust: From the persecution of the Jews to mass murder, Routledge, pp.110-138. ^ Christopher R. Browning (2007). The Origins of the Final Solution: The Evolution of Nazi Jewish Policy, September 1939-March 1942, University of Nebraska Press, p.544. ^ Kochavi, AJ (2001). Post-Holocaust politics: Britain, the United States & Jewish refugees, 1945-1948, University of North Carolina Press, p.176. Zahradnik, Stanisław; and Marek Ryczkowski (1992). Korzenie Zaolzia. Warszawa - Praga - Trzyniec: PAI-press. OCLC 177389723. This page uses content from the English language Wikipedia. The original content was at Silesia. The list of authors can be seen in the page history. As with this Familypedia wiki, the content of Wikipedia is available under the Creative Commons License.